Wade Megan (18) got BU on the board in the second period — and its fans fired up — and celebrated with Cason Hohmann and Garrett Noonan. At the start of Friday night’s game between 13th-ranked Boston University and UMass at Agganis Arena, something — or rather someone — was missing from the Terriers bench. The theme of the evening was a tribute to veteran coach Jack Parker in his 40th season, with dozens of former BU players in attendance for a ceremony that was held during the first intermission. Instead of directing his squad from ice level, though, Parker was forced to watch from a luxury box above because of a back injury that required him to be on crutches. Although it was tense at times, Parker’s team came through with a 5-2 victory in front of 5,062, improving to 2-1-0. Associate head coach Mike Bavis said Parker was touched by the presence of so many people close to him. As for the game, the teams played evenly in a scoreless first period, each having one power play. The Terriers broke through in the first minute of the second period. At the 51-second mark, sophomore center Cason Hohmann delivered a drop pass to senior left wing Wade Megan in the circle. Megan skated the puck into the slot, went to his backhand, and lifted it over sophomore goaltender Steve Mastalerz (20 saves) for the 1-0 lead. BU added another tally at 4:45 on an excellent effort by a pair of freshmen. Defenseman Matt Grzelcyk, positioned in the far left circle, saw center Danny O’Regan charging down the middle. Grzelcyk hit O’Regan with a tape-to-tape pass and O’Regan shoveled the puck into the net for his first goal. UMass came very close to a goal at 12:38 when senior defenseman Darren Rowe teed up a slapper from the left point. Senior center Kevin Czepiel, who was positioned mid-slot, redirected it high and it caromed off the crossbar. The Minutemen cut the deficit in half at 14:57, taking advantage of a BU turnover near the blue line. Junior right wing Branden Gracel skated the puck into the left circle and fired a shot through a screen, beating freshman goalie Matt O’Connor (28 saves) for his second goal of the season to make it 2-1. Penalty trouble cost UMass in the third period. With Rowe already in the box for holding, sophomore defenseman Oleg Yevenko was called for cross-checking at 4:20, giving BU a five-on-three advantage for 55 seconds. The Terriers scored 13 seconds in, with O’Regan potting his second on a shot from just outside the left post to give BU some breathing room. UMass had a chance to close the gap during a two-man advantage for 1:54, but a penalty to junior right wing Michael Pereira turned it into a four-on-three. The Minutemen still capitalized, though, with junior defenseman Joel Hanley potting the power-play goal at 9:27 to make it 3-2. 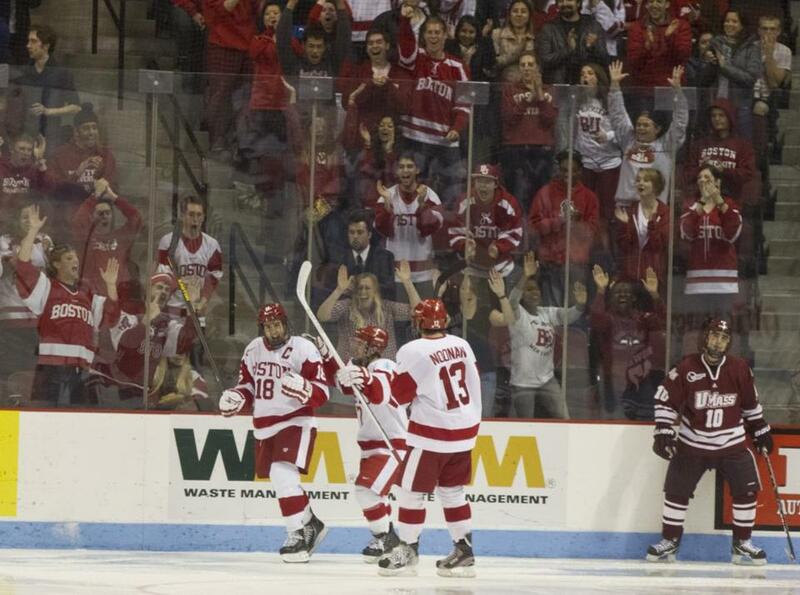 But 43 seconds later, BU regained the two-goal lead on a power-play goal. Hohmann skated the puck into the left circle and, with Megan skating down the middle, faked a pass before beating Mastalerz. Hohmann closed it out with an empty-net goal with 50 seconds remaining. For UMass coach John Micheletto, it’s a work in progress.